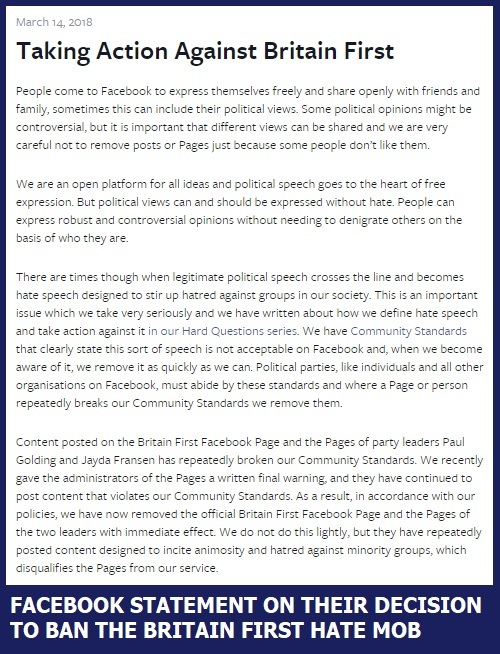 It's taken them years to do it, but Facebook have finally acted to close down the Facebook page of the Britain First hate mob. Of course the alt-right and neo-fascist political commentators will howl that it's unfair and that their fellow extreme-right fanatics are being "censored for their political views", but the reality is much simpler. 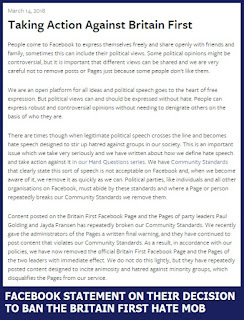 The Britain First page has been shut down because they repeatedly and egregiously defied Facebook's community standards. Aside from inciting hatred towards Muslims and immigrants, they also spread outright lies and shockingly ignorant misrepresentations, desecrated the poppy symbol, promoted misogyny and anti-intellectualism, attacked the minimum wage and low income workers, scammed money out of vulnerable people, routinely censored all criticism to create an extreme-right echo chamber, and encouraged a lawless lynch mob mentality. Then there were the comments: The outpourings of undiluted glee at acts of genocide against Muslim refugees, the celebration of right-wing terrorist atrocities, and even plots to raise a slush fund to incite more people into carrying out acts of right-wing terrorism. And then there's the fact that Britain First's leaders Jayda Fransen and Paul Golding have been jailed for harassing and defaming innocent people, including shouting abuse through the letterbox of a pregnant woman who had a miscarriage in the following days. 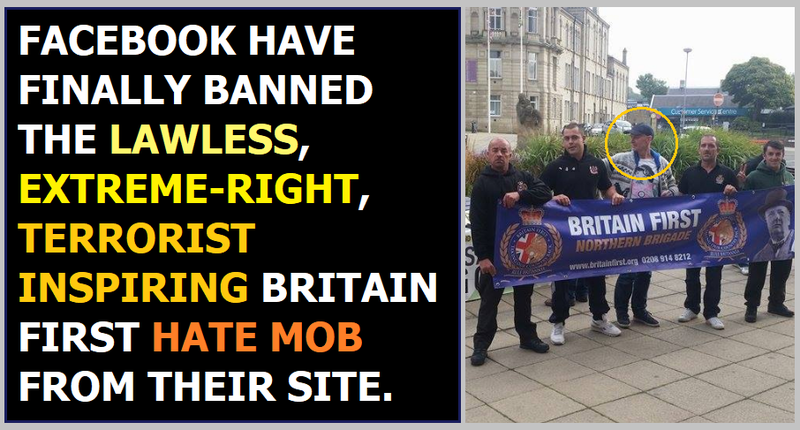 The extreme-right fanatic who murdered the Labour MP Jo Cox in 2016 was yelling "Britain First" as he did it, and was photographed at a Britain First Northern Brigade event earlier that year. And the extreme-right terrorist who carried out the deadly Finsbury Park attack was also radicalised by Britain First in the days before he plotted to kill Jeremy Corbyn, then drove a hire van into a crowd of Muslim pedestrians. The surprising thing isn't that Facebook have banned this vile terrorist-inspiring extreme-right hate group from their site, it's that it's taken them so damned long to do it.